Solar cell metrology; photovoltaic alloys. Using atomic force microscopy (AFM), the National Institute of Standards and Technology (NIST) has developed a pair of novel techniques to measure the chemical compositions and defects in solar cells. The new techniques will give researchers insights into a thin-film solar cell material called cadmium telluride. The technology will also suggest ways to boost the efficiency of solar cells based on this material. For this, NIST used two complementary AFM methods. The first technique, called photothermal induced resonance (PTIR), provides information on the composition and defects of a solar cell. It measures how much light the sample absorbs over a range of wavelengths. Direct-transmission near-field scanning optical microscopy (dt-NSOM) is the second method. This technology captures variations in the composition of the solar cells and defects. It records how much light is transmitted at specific sites within the cell. The new techniques could overcome a number of challenges in the solar cell industry. Today, the solar cell industry uses standard measurement techniques, but they only give limited data in terms of why a given technology operates at sub-standard efficiency. For example, the industry uses electron-beam induced current analysis today. Using the beam of an electron microscope, it enables data on the variations in efficiency. But it gives little information on crystal defects and impurities, which hamper the efficiency of solar cells, according to NIST. The industry also uses two other methods–photoluminescence and cathodoluminescence. Both provide induced light emission from a sample. But they also provide insufficient data on the mechanisms of efficiency losses, according to NIST. 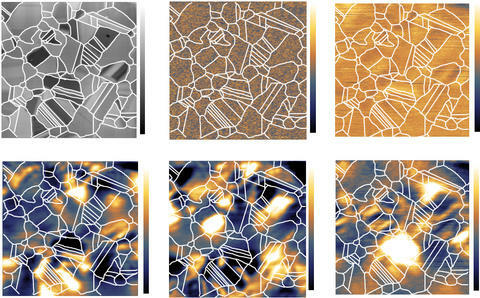 To solve these and other issues, NIST has devised two AFM-based techniques. In PTIR, light is generated from a laser. This illuminates a sample of cadmium telluride. PTIR, in turn, generates data on the spectra of radiation in the sample. Topographic image (a) of a thin slice of a cadmium-telluride sample and images (b-f) of same slice taken with the direct-transmission near-field scanning optical microscopy technique. Meanwhile, in dt-NSOM, light from the AFM probe illuminates a sample. A photodetector measures the amount of light transmitted through the material. 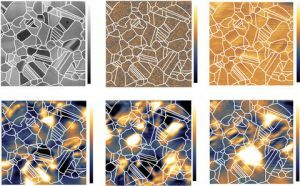 “We’ve now developed new techniques to examine the microstructure of solar cells and demonstrated that we can visualize defects through their optical signature,” said Yohan Yoon of NIST and the University of Maryland, on NIST’s Web site. The University of Michigan has developed a new semiconductor alloy for use in concentrator photovoltaics. The alloy involves the influence of bismuth (Bi) and nitrogen (N) in gallium arsenide (GaAs). The alloy, dubbed GaAsNBi, can capture the near-infrared light located on the leading-edge of the visible light, according to researchers. And GaAsNBi is easier to manufacture and is up to 25% less expensive than previous formulations. The alloy is aimed for concentrators. Concentrator photovoltaics gather sunlight on small solar cells based on GaAs or germanium. They enable efficiency rates of over 50%. In comparison, conventional silicon-based solar cells have efficiencies in the mid-20 percentile. Concentrator photovoltaics are based on three semiconductor alloys layered together using molecular-beam epitaxy. But near-infrared light escapes through the cells. As a result, researchers have been developing another layer to prevent this occurrence. The layer could be incorporated into the cells to capture this light. Hoping to find this material, researchers from the University of Michigan have discovered a new type of arsenic molecule. It would potentially pair more effectively with bismuth. Nitrogen is added to the mix. The materials were doped, which in turn enabled the GaAsNBi alloy. “Essentially, this enables us to make these semiconductors with fewer atomic spray cans, and each can is significantly less expensive,” said Rachel Goldman, a professor of materials science, engineering and physics at the University of Michigan. “In the manufacturing world, that kind of simplification is very significant. These new alloys and dopants are also more stable, which gives makers more flexibility as the semiconductors move through the manufacturing process.